The very public expressions of concern over bird flu this week by a number of major public health agencies around the world (see Updated CDC Assessment On Avian H7N9 & ECDC RRA: Human Infection With Avian Influenza A(H7N9) Virus, Fifth Update ) have been driven by a number of recent developments involving multiple subtypes of avian flu. These developments include recent changes in their geographic range, increased virulence of HPAI H5Nx in (usually fairly immune) waterfowl, an unprecedented number of poultry outbreaks in Europe, the emergence of new subtypes and/or clades of HPAI, and a very early and vigorous arrival of H7N9 in China this winter, with more than 200 people infected since November. While we've seen similar events before, never have we seen them occur in as many places (see map above) - and involving as many different avian subtypes - as we are seeing today. While none of this guarantees that one of these viruses will adapt to humans well enough to spark a pandemic, the risks do appear heightened. 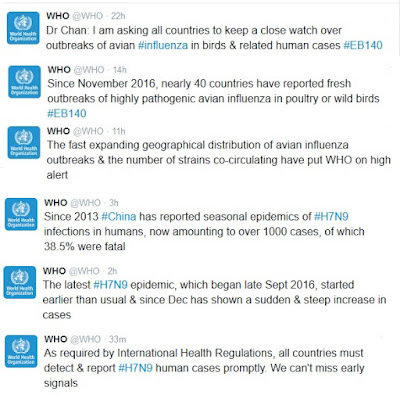 Overnight, the World Health Organization tweeted the following messages. While our focus is divided between two `main' types of avian flu - H7N9 in China and HPAI H5 in Europe and the Middle East - in truth, we are talking about scores of genotypes and dozens of clades, all spread across multiple subtypes (H5N1, H5N6, H5N8, H5N5, etc.). Each of these `variants' has its own traits, and is on its own evolutionary path. While most will be failures, the more rolls of the genetic dice avian flu gets to take, the better the chances one proves unlucky for public health. The three with a track record of infecting (and killing) humans are H7N9, H5N1, and H5N6. And so they are naturally the ones that are of most immediate concern to public health officials. Those that have only affected birds (H5N8, H5N2, H5N5) are close relatives to H5 viruses that have jumped to man, and so they could someday become a human health threat as well. Complicating matters, our ability to track these viruses is limited in many parts of the world. Sometimes this is due to a lack of surveillance and reporting capability in low resource countries, while other times it is because some countries are reluctant to disclose cases either publicly, or to the WHO. Either way, the risk of being blindsided is ever present. Somewhat unexpectedly, there are a number of countries that - in the past - have reported a great deal of bird flu activity (including human cases), which have reported very little this year. Egypt, Indonesia, Vietnam, Cambodia . . . all hotspots in the past, are unusually quiet. One of the big mysteries this year is how HPAI H5Nx has spread so readily via migratory birds in Europe and Asia, while killing its avian carriers at a much increased rate. Prior to 2016, H5Nx was notable for only rarely being detected in wild and migratory birds, and for disappearing entirely in North America for a full year after our 2014-15 epizootic. As a result, six months ago in PNAS: The Enigma Of Disappearing HPAI H5 In North American Migratory Waterfowl, it was proposed that HPAI wasn't well maintained in migratory waterfowl, and that would limit both the extent and duration of outbreaks. Since then, H5N8 in Europe, and to a lesser extent - H5N6 in Korea and Japan - appear to have overcome this limitation, and are spreading faster and farther via migratory birds than we've ever seen before. What happens this summer remains to be seen, but for now, they are successfully and impressively winging their way around the world. 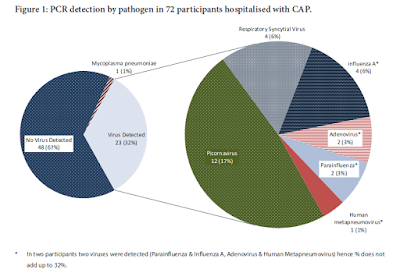 And while H5N8 hasn't been detected in humans, 10 days ago in Sci Rpts: H5N8 - Rapid Acquisition of Virulence Markers After Serial Passage In Mice, we looked at some laboratory experiments that suggest is has the capability to adapt to mammalian hosts. Based on what we know, however, H7N9 in China is of greatest concern. It has a four-year track record, where it has infected at least 1000 people, and among those sick enough to be hospitalized and tested - it has killed roughly 40%. How many mild or moderate cases go undetected is unknown, and so the 40% fatality rate is likely overblown. But even a mortality rate 1/20th of that would be a catastrophe in a global pandemic. This year's sharp and early increase in cases is worrying, but for now we haven't received any word of sustained or efficient human-to-human transmission of the virus. Unless and until that happens, H7N9 will remain a local, and limited threat. The problem is, we aren't getting as much, or as timely, of information out of China as we'd like (and have gotten in the past). With the Chinese New Year's celebration in full swing - and likely to remain so for the next week or so - we may see even fewer updates over the next few days. In previous years, any one of these individual outbreaks (an aggressive H7N9 epidemic in China, a major H5Nx epizootic in Europe, or H5N6 jumping to Korea and Japan) would be enough to raise concerns. This year, when we are seeing them all happen concurrently, serves to amplify those concerns. Despite the warning signs, we've an astonishingly bad record of reading the tea leaves and predicting the next big public health threat. A decade ago, while we were watching H5N1 burn across Indonesia, Vietnam, and China we were blind sided by a North American Swine H1N1 pandemic. In 2013, while we concentrated on H7N9 in China and MERS-CoV in Saudi Arabia, the worlds first urban Ebola epidemic began to devastate West Africa. And in 2015, while both MERS and Ebola still had our attention - Chikungunya, followed by Zika - took the Americas by surprise. The takeaway being, I suppose - that while we may not know what comes next - we can be pretty confident that the next global health crisis is always just around the corner.